Celtics will draft at #27 - Part 1 - ball-handler, wing or big? We all know that mock drafts from mid-first-round on are all over the place. 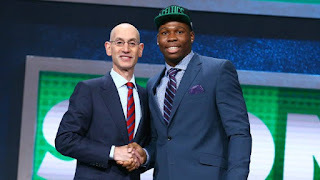 But with the Celtics apparently drafting at the 27th slot, most of our readers have a good idea of the type of player that Danny Ainge should select, and some know exactly the specific guy they want drafted. Realizing that Ainge and Brad Stevens go for versatility, there will be overlap on the positions (Ex. ball-handler/wing combo). There will be a Twitter poll at the end of this article, and we are looking for the one specific position that should be the focus of the Celtics draft. Depending on the response, Part 2 may focus on the type of player needed, such as shooter, defender, rebounder or distributor. Based on the poll results, Part 3 may come down to a choice of four specific player prospects. You get a chance to vote for one of the four. So, for example, if your guy is De'Anthony Melton, vote for a ball-handler. If you want Bruno Fernando, vote for a big. If you don't have a player in mind, vote for the position that you feel needs attention on the Celtics roster. As I sit here writing this, I quickly gathered 14 draft prospects slotted at #27 from 14 different mock drafts. Kyri Thomas, Gary Trent, Jr., Troy Brown, Grayson Allen and Keita Bates-Diop are also among the 14. We know the Celtics have an abundance of talented wings, but that doesn't mean Danny won't pick another one in this draft. The thinking is you can't have too many. Assembling talent and draft picks is what Ainge looks to do. We are fairly well set at the ball-handler position but the salary cap might change that. A two-way ball-handler may be the target. And we certainly could use a another talented big. So lets hear from you. This gives our avid readers a chance to voice their opinions. Going to be an exciting few months.